The summer of 1966 brought “Batman: The Movie"! Now, in the winter of 2016, Tim and Paul, joined by “Batman at 45” author Chris Gould, look at the film from many directions: the fantastic music, the new elements not seen in season one (Compressed Steam Batpole Lift! ), the references to Lyndon Baines Johnson (both the man and his policies! 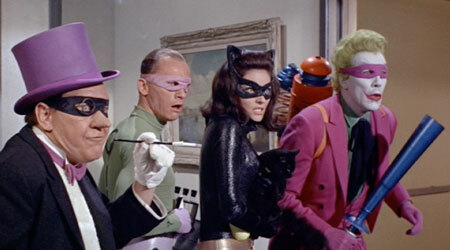 ), the dangers on the Batman set, the dynamic among the four villains, and much more.